Personalize and improve the treatment outcome of each patient visit easier than ever before - while increasing clinic efficiency and profitability. Extract more accurate patient feedback and improve doctor/patient engagement. Customize and create your own loyalty program and provide redeemable benefits and merchandise. Understand your patient outcomes better. Conduct targeted clinical research based on condition, symptom or treatment using real-time data. Access real-time data and analyze records to provide optimal treatment. Sort by gender, age, medical condition, symptoms, strains, administration methods, effectiveness as well as treatment frequency. 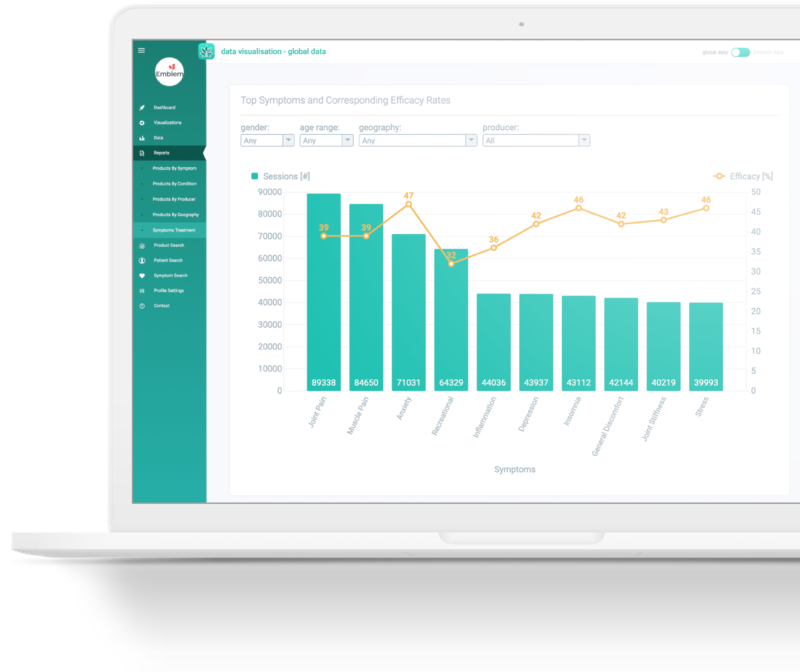 Conducting your own clinically-focused cannabis studies with custom surveys and validated questionnaires is now possible thanks to Strainprint Analytics. Compare the results with a full global data set, giving you access to results from tens of thousands of other patients. Get a 360-degree detailed view of your patients’ treatment efficacy based on product, administration method, chemical composition, dosing and more. Intuitive modular based features with seamless interconnectivity provide quick access to patient reports, product descriptions, and large data analytics. Save time and drive efficiencies with each patient.